When you are always on the run, it is important to keep your belongings safe. 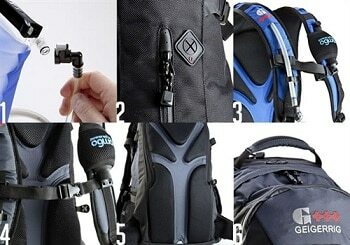 With the best running backpack, you can participate in any activity while being hands free. Whether you are taking a run, camping, or hiking, a great bag can help you keep your belongings organized and prepared for the next step ahead. Whether you want a small and light weight bag that can carry clothing for a day trip, or a bigger bag with many pockets and handles for athletic needs, there is a perfect bag for you. Being comfortable with your load and how it is being toted can improve your daily activities in many ways. How Can I improve My Outdoor Hobbies? In order to pick a running backpack that is perfect for you, you need to determine what you’re going to be doing and how you’re going to use it. After all, this is something that has to be comfortable while you run, or you’re going to start resenting it. You also have to take into account your body size and shape, and women need to consider how the backpack straps will fit across their chest. Size: depending on how long you’re going to be riding for, you’re going to need a backpack that can carry all of your stuff. If it’s a short ride, then you may only need enough space for your hydration, but if you’re going for a longer ride, then you’ll need extra space for snacks and possibly a towel. Weight: running or riding means that you want to travel as light as possible, so look for backpacks that aren’t going to weight you down. Synthetic materials are definitely going to be lighter, and waterproof/water-resistant. Straps: comfortable padded straps are the best way to go, as they won’t chafe or dig into your shoulders. Also, go for straps that are adjustable, so that you can always make them as snug as possible and not bouncing around while you run. Hydration: hydration is key when you’re going for a run, but how big of a bladder should you get? If you’re only going for short walks, then you should choose something small between 1 and 1 1/2 liters. Two-liter bladders are in the middle of sizes, and is a general all-around size for average runners. Three liters are best for those who are trail runners and full marathon runners. Material: if you’ve ever experienced sweat on your back while you wear your backpack, then you didn’t do enough research. Look for materials that are breathable but also strong enough to withstand the elements and the rugged punishment you’ll put it through. Mesh pockets will help you to see what’s in the pockets, and are capable of expanding to hold your slightly larger objects. Safety: running on the road means that you have to be as visible as possible so that drivers and other pedestrians can see you. That’s why you should invest in a running backpack that has reflective strips on it so that you’re easy to see. You can also look for a bag that comes with an emergency whistle or provides the means for you to attach one to your bag. Specific Features: ripstop and nylon mix, multiple pockets, a wet laundry compartment, fold away helmet flap, compatible hydration system. Description: For those who need a reliable bag that will not hold them back, the Deuter Race Exp is a perfect choice. The three sided ventilation helps make an extremely light and comfortable trip for those who use the product for running. With hip fins, the bag securely hugs to you with every move you make. The bag is big enough to fit your desirables and keep them safe from any precipitation with rain cover. To ensure you are safe, the bag is equipped with reflectors on the front, side, and back of the bag. If you want to stand out or blend in, it comes in three colors. Whether you want black and white, ocean blue and white, or spring green and anthracite gray, you can match your bag to your personality. Related: The Deuter ACT Trail 28 SL Backpack is comparable to the Deuter Race EXP Air because it offers the same amenities for a similar price. With a compatible hydration system and wet laundry compartment, this product can also be used for camping, hiking, and cycling. Dimensions: 14 x 9 x 6 in. Specific Features: lightweight synthetic material, breathable elastic power mesh, easy accessible 4D pole holders. Description: Categorized as one of the best running products, many users say that the Salmon S-Lab ADV Skin Hydro bag is so lightweight that they cannot feel it when they are completing taxing activities such as running marathons! The S-Lab offers a customizable fit that is not only stable but is breathable for even the most intense athletes. There is nothing holding you back when you are wearing the S-Lab, there is even a pole holder that provides you with an easy grip. The product also comes with two 17 oz. soft flasks to keep you hydrated while you are completing demanding activities. Lose items are known to fit in the S-lab like a dream even when running. There are three colors to choose from when purchasing your new bag. Related: The Salmon S-Lab Advanced Skin 3.5 Set Racing Vest is perfect for those who need slimmer pockets and smaller compartments but still need storage for personal items. Similar to the bag, the vest features the same light and synthetic material and two soft flasks for hydration. Dimensions: 18.9 x 3.94 x 11.81 in. Specific Features: carries up to ten liters of gear, internal sipped pocket, ergonomically-shaped shoulder straps, hydration reservoir. Description: Simple and efficient for those who don’t need extra amenities, but need a lightweight bag that can be used in extreme conditions. The breathable material does not cause any added stress when you are on your journey. With all of the necessities in a comfortable and supportive bag, you can participate in many activities. For those who enjoy traveling, running and biking, this Arc’Teryx Aerios 10 is equipped to hold all of your possessions in a compact bag. With easy to grab ribs on the side of the bag and noise reduced zipper pulls, it is easier to swiftly access your belongings. All of the bases are covered with this minimalist bag on your back in any activity. Customers praise the product for its great ergonomics. Related: The ArcTeryx Arro 22 Backpack is similar to the Aerios 10 in their price range and in their simple design. The Arro 22 features a hydration reservoir and is made from a light nylon material. Both bags work excellent for camping, hiking, and day-to-day activities. Dimensions: 18 x 9 x 8 in. Specific Features: lightweight, large loading panel, multi-functioning interior sleeve. Compatible packs are easily attached to your larger packs. A key clip keeps your keys in a reliable place where you can always find them. Best Use: Day hikes, running, and as a carry on bag. Description: Many customers believe the Daylite Backpack is one of the best running products because it is the perfect size for a quick change and looks nice. If you have small needs when you go on jogs or a trip, this product is perfect for you. You can hike without any bulky items and still look stylish with clean seam lines. The lightweight bag offers a padded back panel for comfort if you must tote it around for a long period of time. You can even carry it on your back as you run. If you are going on larger trips, you can easily attach your lightweight bag to your larger hiking pack for convenient travel. Related: The Osprey Packs Daylite Plus Daypack is similar to the Daylite Bag because it is functional enough for the light packer and has a sleek design. For a reasonable price, both of these products provide comfort and ventilation for those who like to stay active. Dimensions: 18.5 x 10 x 7 in. Specific Features: butterfly opening to hold larger items such as jackets and picnic blankets, bungee cord system, hydration reservoir. Description: The Oasis 1100 fits like a regular bag and is well equipped for a day trip anywhere. With attached hauling loops inside the bag, you can carry large items like a bike helmet with no problem. The breathable mesh back panels, shoulder straps, chest straps, and built in shock absorber are perfect to keep you feeling comfortable in any situation. The pockets are large in size and give you instant access to your necessities. Regardless of the length of hikes you like to take, the Oasis 1100 will not strain your back. If you like to take your bag everywhere, this is the perfect quality of bag for a great price. Related: The Outdoor Products Mist Hydration Pack has mesh shoulder pads and back panels for comfort like the Oasis 1100. Both products are available for budgeted prices and can stand up to wear and tear, outdoor activities, and more. Dimensions: 9 x 14 x 25 in. Specific Features: 3-liter reservoir, aeromesh back panel, adjustable sternum strap, hydration port. Description: A water resistant bag offers a front expandable, stretch mesh pocket with a 3-point compression system. The Miwok 22 comes in an attention grabbing orange that is sure to catch attention. With fleece lined media pockets, your many devices can be protected from any natural elements. A key clip and webbing loop helps secure all of your products in an organized fashion. There are specific places for securing bicycle lights and reflectors if you need them for your bag while you are hiking. All of your small things are separated from the larger which helps locate your items in a flash. The high quality material is long lasting and is visually appealing. Related: The Deuter Speed Lite 10 Backpack comes in bright colors similar to the Miwok 22 and has many pockets for organization. Both bags are great running because they are light and durable. Regardless of the elements you can take this product with you wherever you go. Dimensions: 4 x 11.8 x 21.65 in. Specific Features: filter, drinking reservoir, filtered water sprayer, mesh padded shoulder straps, abdomen clip. Description: The 1200 Hydration Pack is made of a 100% heavy-duty Dura Oxkin and a 100 oz. squeezable water reservoir that sprays water. The reservoir is easy to refill and easy to clean. The internal storage structure of the bag easily keeps your belongings separate from others. In order to keep your items protected, the side storage pockets are reinforced with PVC and has reflective zipper pulls for easy access. This product not only carries the extensive hydration reservoir, but it can hold enough belongings for a quick run or hike. Related: The Geigerrig RIG 1600M Hydration Pack is similar to the Geiggreg G1 1200 Hydration pack because they both spray filter ready water for keeping cool or keeping hydrated. With large storage compartments, more can be carried than the water reservoir. Both products are light enough for running, yet sturdy enough to carry important belongings. Dimensions: 21 x 12 x 8 in. Specific Features: light and durable shell, vertical ski carry, diagonal ski carry, fleece-lined goggle pocket. Descriptions: With the Dakine Heli Pro Backpack you can expect the ability to carry all of your necessities in the organized front pocket like your clothing, technological devices, food, drink, and more! Many customers rave about this option and the ability to perform in the actions of storing a laptop while going on morning on a bike to your job. The multi-use bag also is appealing to the eyes with a slim profile, and no bulky and excessive pieces. The comfortable shoulder straps are made to feel like they aren’t there. You should not tote your belongings, your bag should. Your back and posture will thank you later! Related: The Dakine Mission Backpack is great for the cold just like the Dakine Heli Pro Backpack. With fleece lined goggle pockets and a vertical snowboard carry you can be hands free as you hit the slopes. Both bags are in the same price range and are offered in many different styles and colors. What Is The Best Bag for Me? Now that we have come to the end of the list, we have provided many examples of backpacks available online. With a broad array of options, they are available for everyone. However, it is hard to determine which one has features that meet your needs. When you purchase a great bag, you can do more activities than run! In fact, you can do whatever you want to! You can use a bag to get you from point A to B, without leaving any of your belongings behind. Or bring your belongings with you by carrying necessities for camping or going on a hike. Match your style when you consider factors such as color, size, and seam patterns. You can have a smooth and sleek black bag, or switch up your style and choose one that is bright and full of life! Everyone needs a helping hand in life. If there is a feature you would like to see in a bag, that was not included in the list above please comment below! We are always eager to hear our reader’s feedback, and we want to help you find the best running backpack that fits you, personally!